Laparoscopic gastric greater curvature plication (LGGCP) has been presented as an alternative to laparoscopic sleeve gastrectomy (LSG) for reversible reduction of stomach capacity without gastric reduction or stapling. We present a case of a 51-year-old Hispanic female with a BMI of 41.91 kg/m2, who underwent (LGGCP) 5 years previously at another institution. 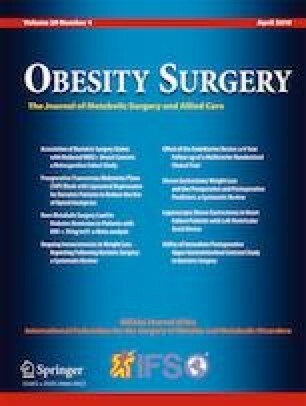 Despite multiple interventions, the patient was unable to successfully lose weight, and the decision was made to reverse the procedure with a robot-assisted Roux-en-Y gastric bypass. The plication was intact extending from the fundus to the antrum, with the sutures incorporated by scarring and fibrotic tissue. Sutures were delicately removed to form a 30-cc pouch, followed by jejuno-jejunal and gastrojejunal anastomosis. The patient tolerated the surgery well and control fluoroscopy was negative for anastomotic leaks, patient was discharged home on POD 2. At the 40-day follow-up, the patient had lost 22 lb., reducing her BMI to 37.64 kg/m2. The 3D vision of the robotic camera and the six degrees of freedom of the robotic instruments seemed to facilitate the challenging dissection of the embedded sutures used for the LGGCP and its overall undoing. However, further volume and data on the robotic approach for this specific revisional procedure are necessary before drawing any definitive conclusions. The online version of this article ( https://doi.org/10.1007/s11695-019-03721-x) contains supplementary material, which is available to authorized users.